With the development of the Internet and smart phone, mobile data sharing have been attracted many researcher’s attentions. 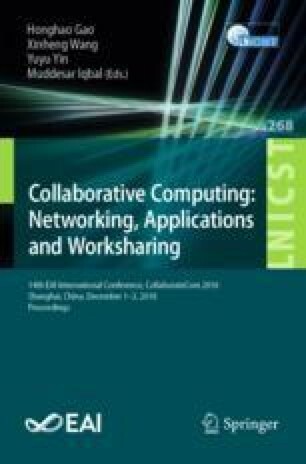 In this paper, we investigate the mobile data sharing problem in mobile crowdsensing. There are a large number of users, each user can be a mobile data acquisition, or can be a mobile data sharing, the problem is how to optimal choose users to collaborative sharing their idle mobile data to others. We consider two data sharing models, One-to-Many and Many-to-Many data sharing model when users share their mobile data. For One-to-Many model, we propose an OTM algorithm based on the greedy algorithm to share each one’s data. For Many-to-Many model, we translate the problem into the stable marriage problem (SMP), and we propose a MTM algorithm based on the SMP algorithm to solve this problem. Experimental results show that our methods are superior to the other approaches. This work is partially supported by the NSF of China (No. 61502359, 61602351, 61572370, and 61802286), the Hubei Provincial Natural Science Foundation of China (No. 2018CFB424), and the Wuhan University of Science and Technology Innovative Entrepreneurship Training Program (17ZRA118).